First Grade Critter Cafe': Behavior Bucks Celebrating Smart Choices in the Classroom! Behavior Bucks Celebrating Smart Choices in the Classroom! I am so super-excited to share some fantastic classroom management ideas with you today! The summer has been super-sweet and giving me alot of PINspiration! One of those fabulous pins happened to be using classroom dollars to reward student behavior. In years previous, I have used clothespins and self-adhesive bling to reward smart choices in my classroom. The bling is becoming increasing harder to find and with these new Pinterest ideas already on my mind, I got busy brainstorming how this new inspiration will unfold in my first grade classroom this year! 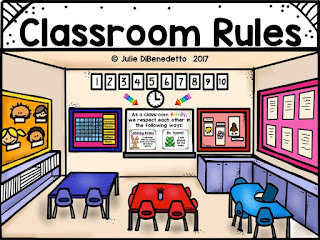 First we will lay a strong foundation with 8 non-negotiable classroom rules the first week of school. The kids will also have opportunities to ADD to this list as the year goes on. Once we have a strong understanding of the HOW and WHY each of these classroom rules work, I will introduce our Rewards Program! Of course, the kids may have additional tips and ideas that we can add to the Earning list! During my research, I found that some teachers start the week by adding 3 behavior bucks to the students' envelopes. I think I will follow that weekly routine. I will award bucks for all things positive and students will need to pay me for poor choices made. 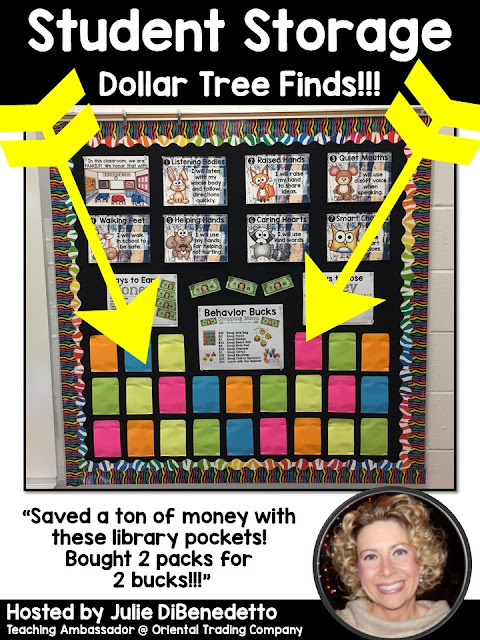 I wanted our Behavior Bucks to be original and meaningful to just our class so I Googled "play money images" and downloaded a buck that I then placed a photo-image of myself on-top of it! I was able to fit five bills on one page. Now the timing of this next gift couldn't have been MORE PERFECT! My sweet teaching friend Alyce, sent me this OUTSTANDINGLY-AWESOME teacher apron last month! I am going to store all my Behavior Bucks inside the apron for easy access and delivery! What will my rewards look like? I needed some inspiration so I dropped by Oriental Trading Company and did some window-shopping! JUMPING UP AND DOWN when this special delivery arrived!!! Need to know the details of my shopping list? I grabbed some neon baskets (Dollar Tree) to house all the Rewards. These peek-through containers will keep the kiddos EXTREMELY motivated to EARN Behavior Bucks!!! Every three weeks or so, "Mrs. D's Dollar Store will OPEN for BUSINESS!" Students can choose to spend or save! Fingers crossed, the kids love our new behavior rewards program and it makes for a very uplifting and positive year! If you are interested in my Classroom Rules posters, click here (or on the image below) to visit my TPT Store. Special Thanks to Katie and all my friends at Oriental Trading Company for some great classroom inspiration this year! Super awesome!!! I really want some of YOUR money! That is so fantastic!! Your kiddos are going to LOVE the money (and may save it instead of spend it!). Thank you so much Alyce!!! I am excited to tie in spending/counting money/consumer/producer with this project as well! Here's to a great school year!!! A great school year indeed!